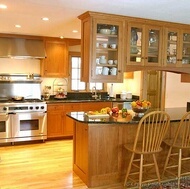 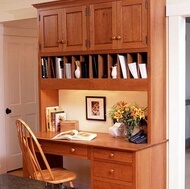 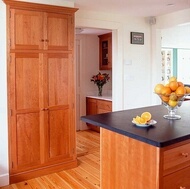 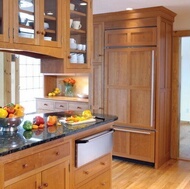 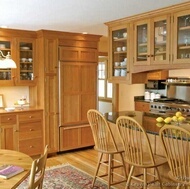 Shaker kitchen cabinets are a popular option in today's kitchen remodels. 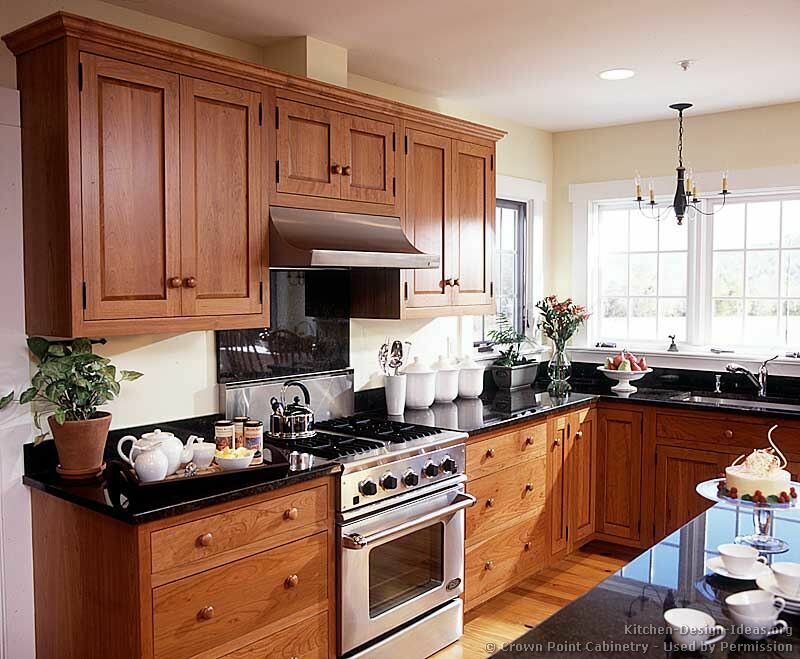 Today's shaker style kitchens resemble the Arts & Crafts and Craftsman styles, albeit with even less ornamentation. 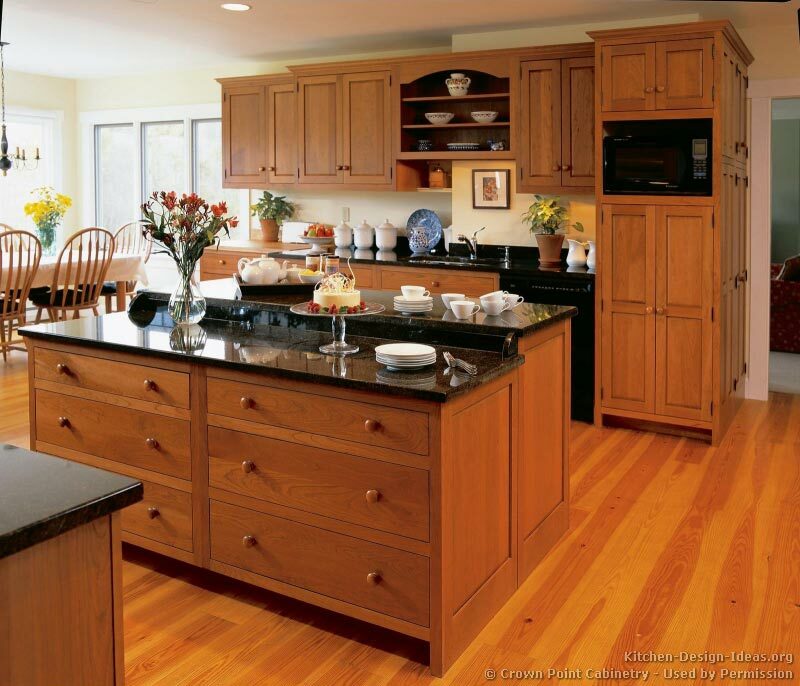 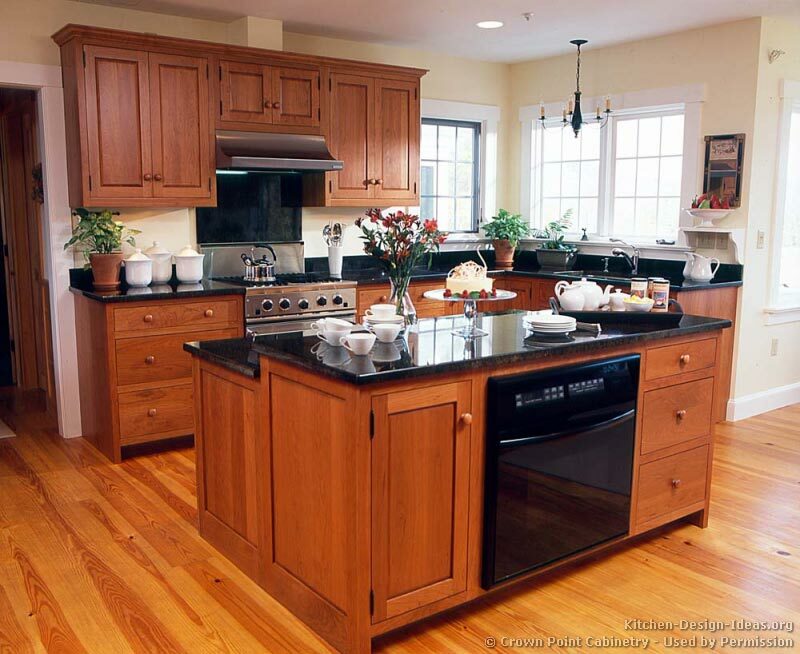 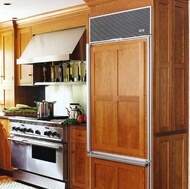 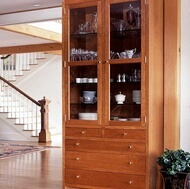 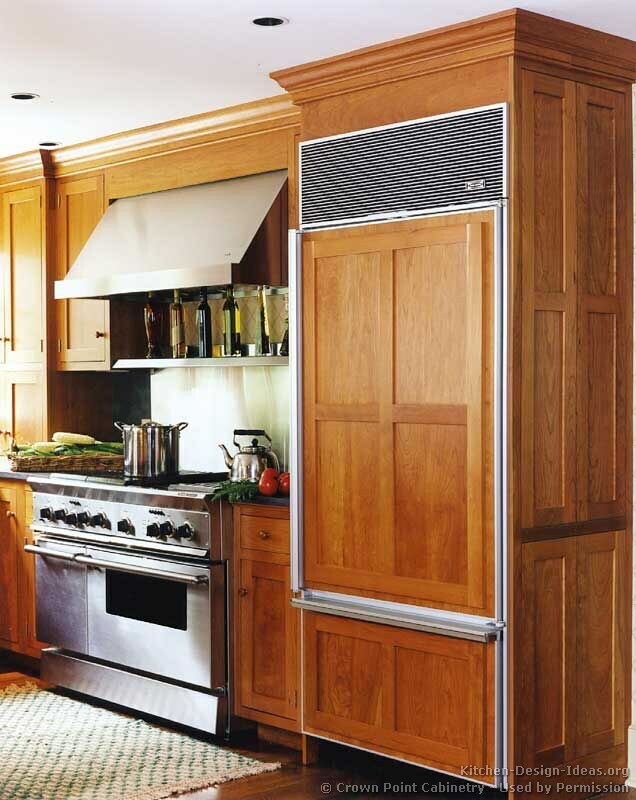 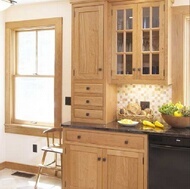 Utilitarian designs, tapered posts, flat paneled doors, and sturdy construction are trademarks of the Shaker design. 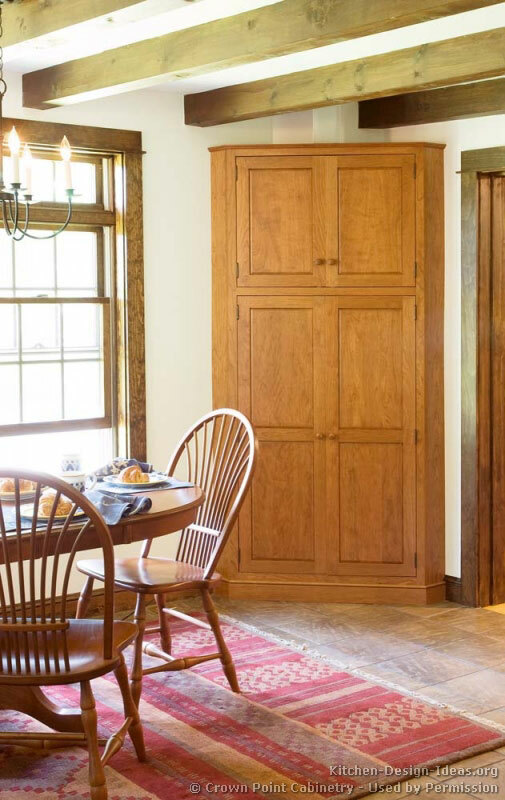 A Bit of History: The Shaker style pre-dates the Arts & Crafts style by more than 50 years. 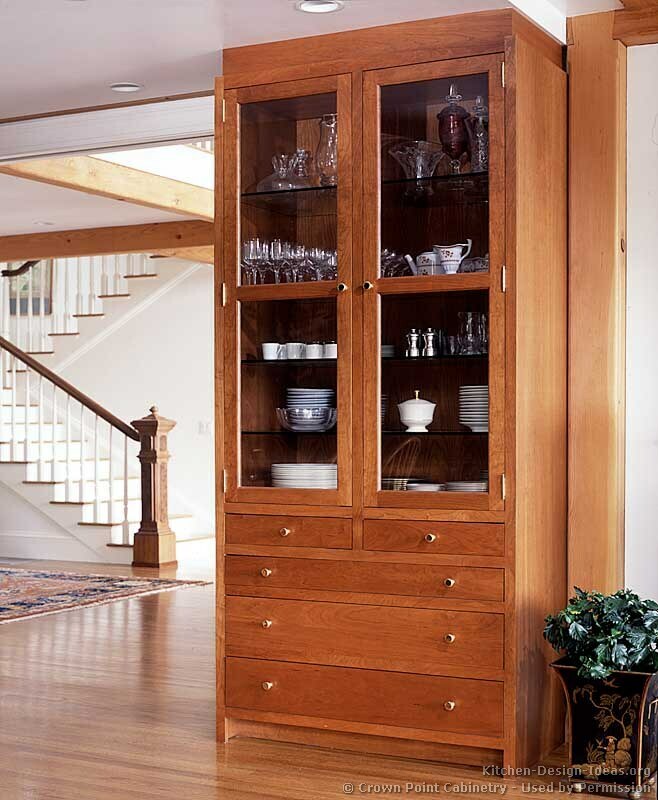 The Shaker movement originated among religious groups in America around the year 1820, with a focus on simplicity. 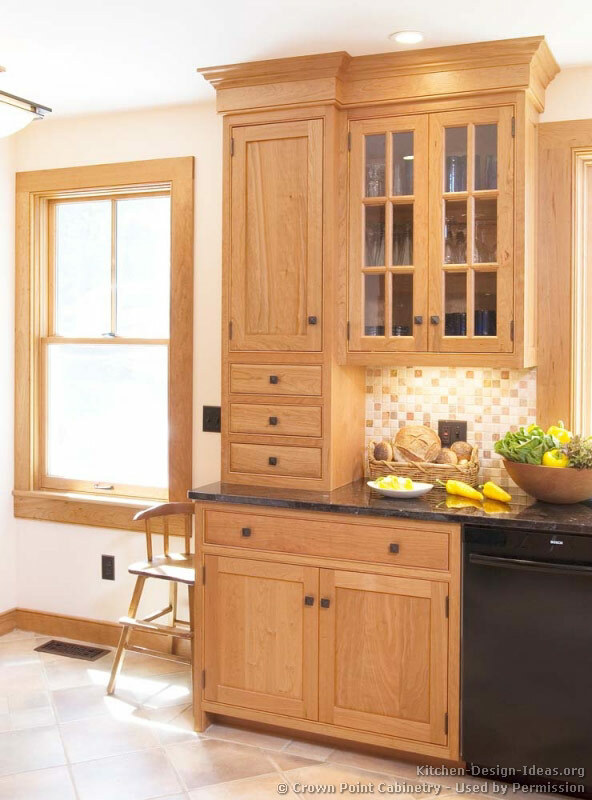 Today, nearly 200 years later, the style is thriving all across the country, with even some contemporary kitchens incorporating Shaker style cabinet doors. 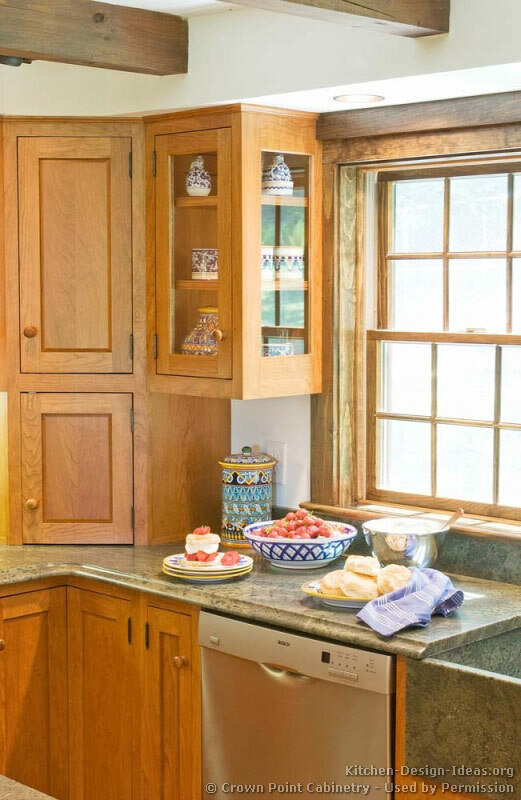 The gallery on this page highlights the more historical Shaker style. 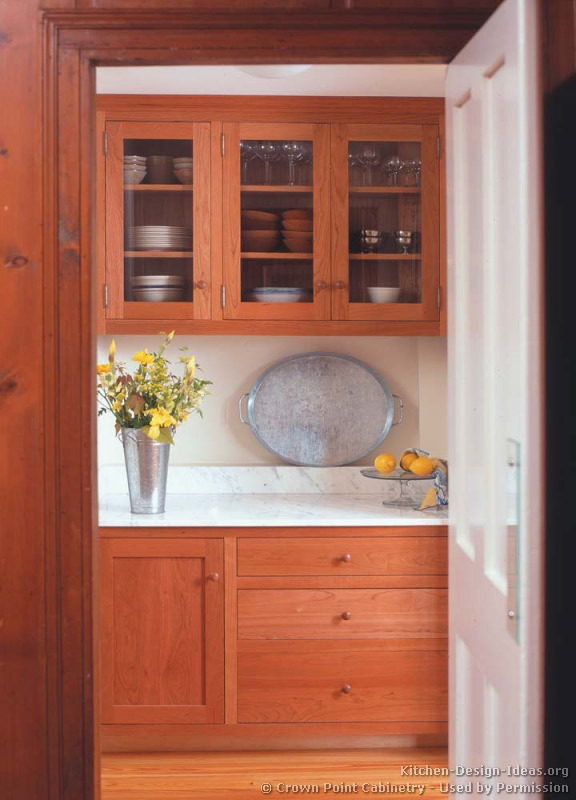 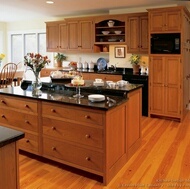 Appearance: Shaker kitchen cabinets feature mostly straight lines, gentle curving lines, and moderate proportions. 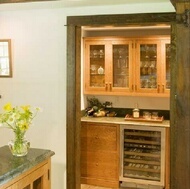 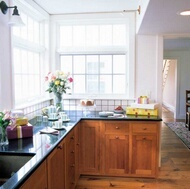 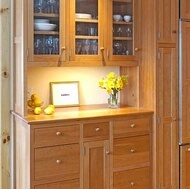 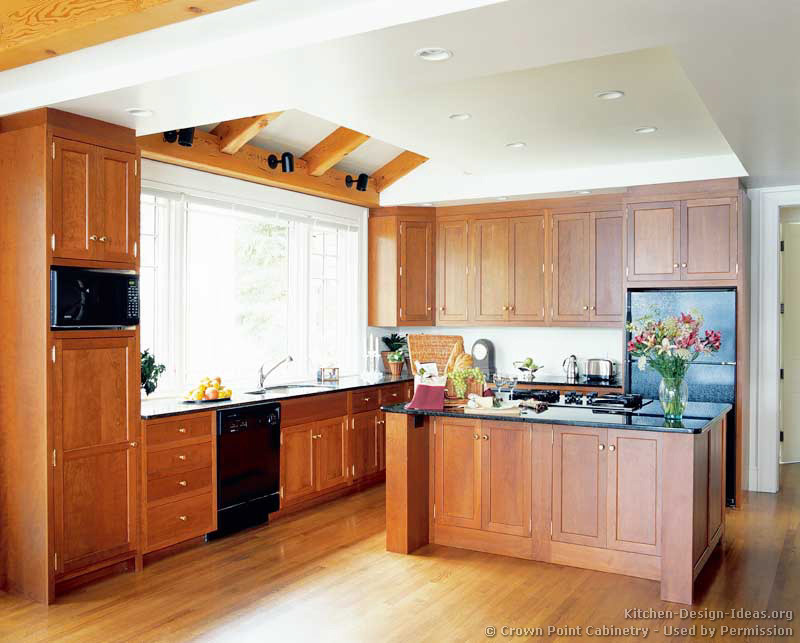 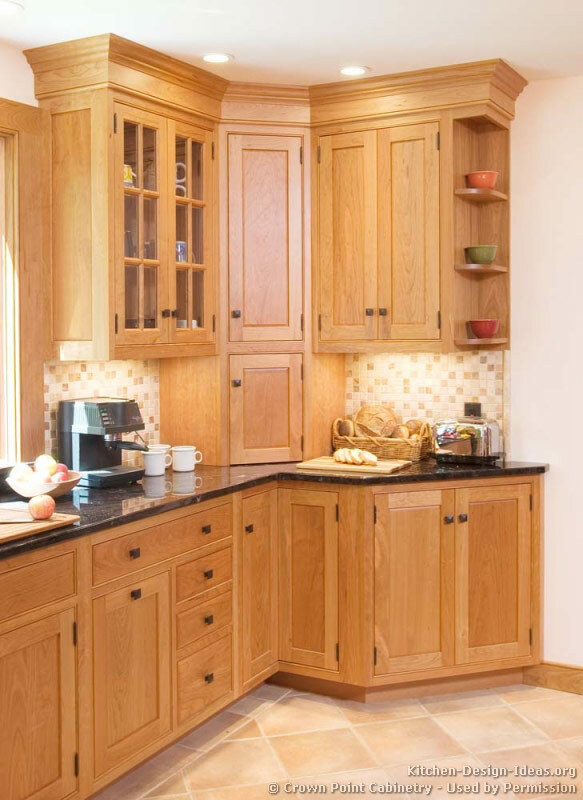 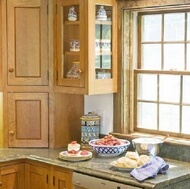 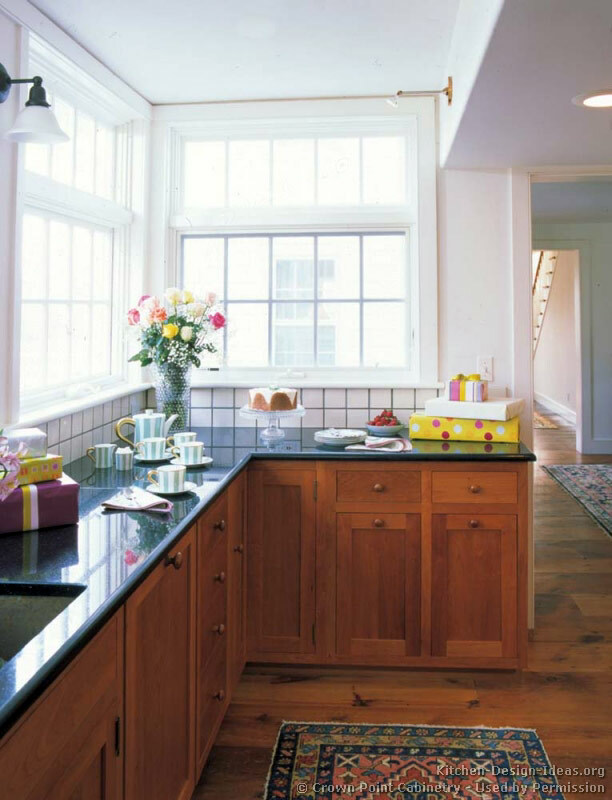 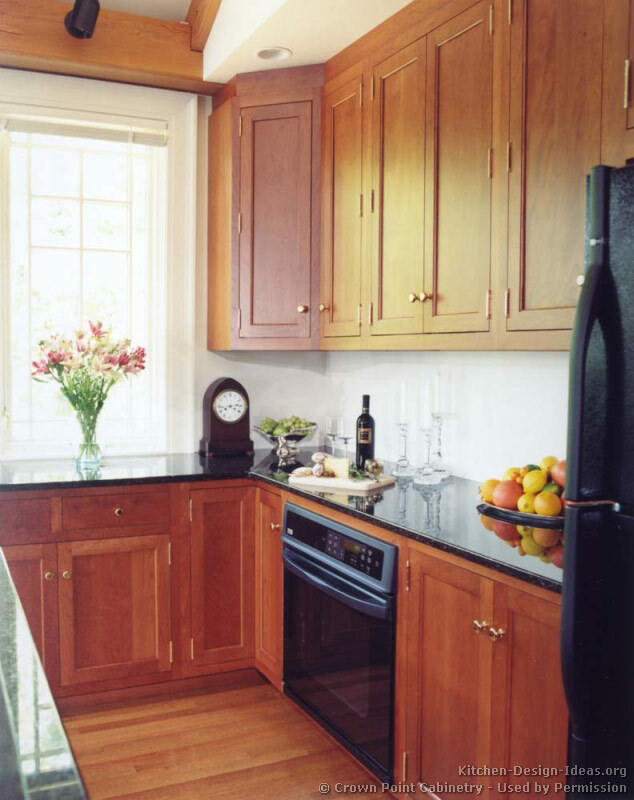 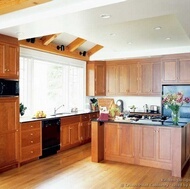 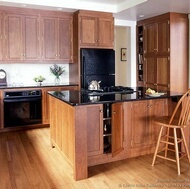 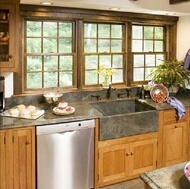 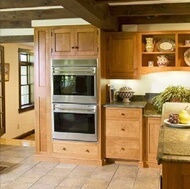 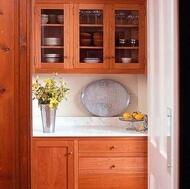 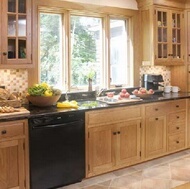 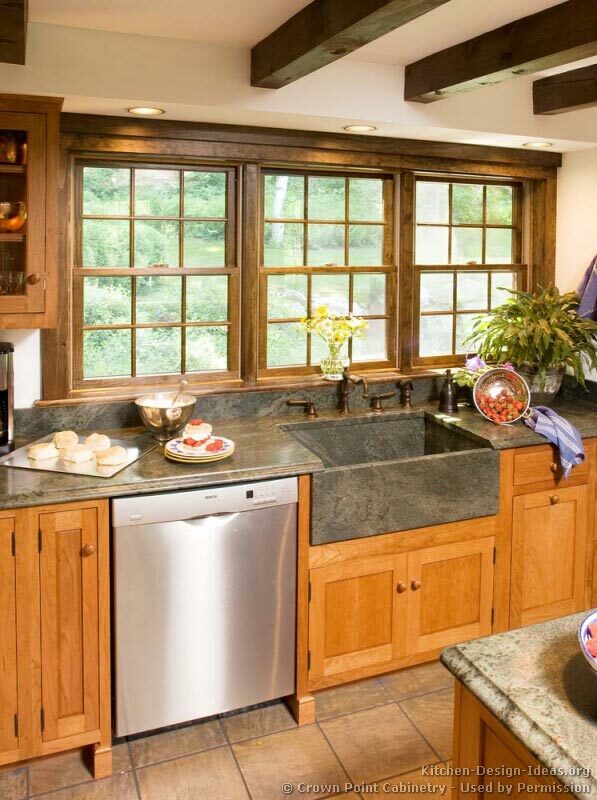 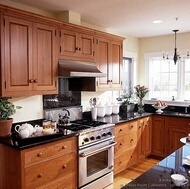 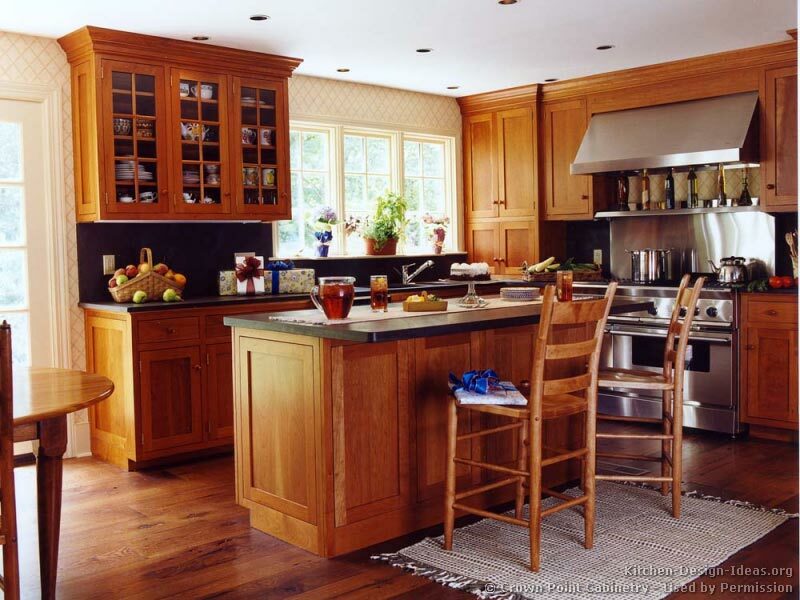 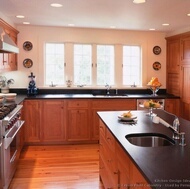 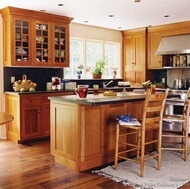 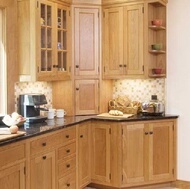 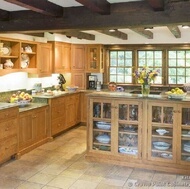 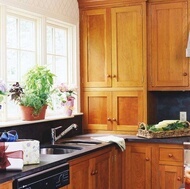 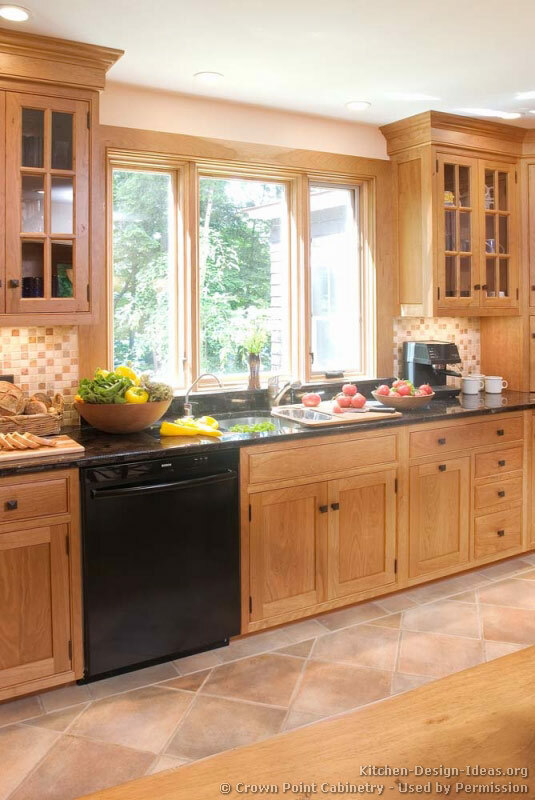 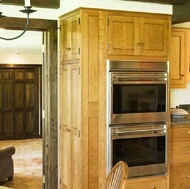 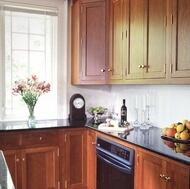 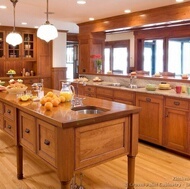 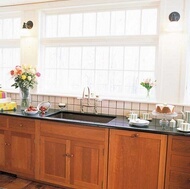 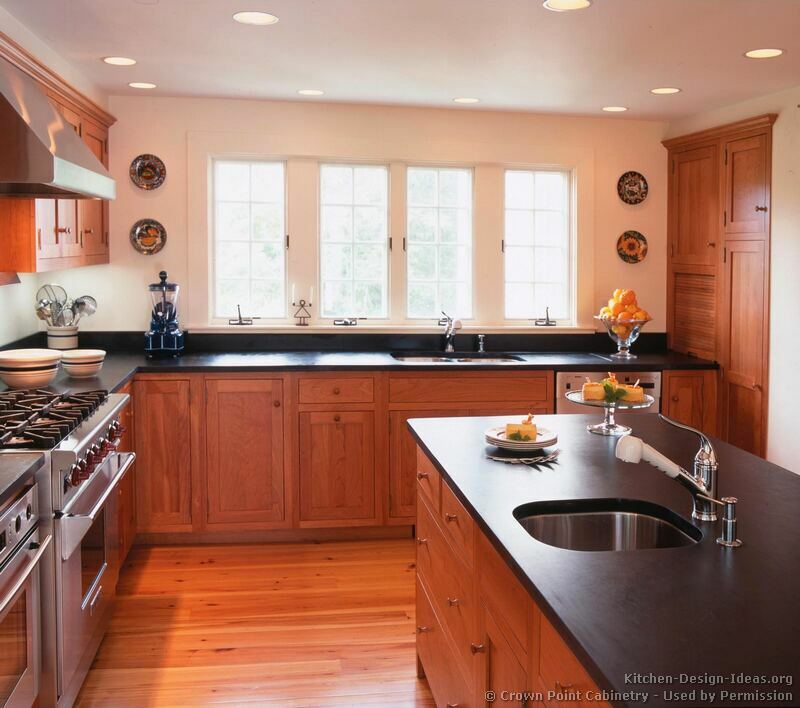 Shaker kitchens bear striking resemblance to Craftsman kitchens, both of which usually employ Shaker cabinet doors which are flat paneled with flat cope and stick frames. 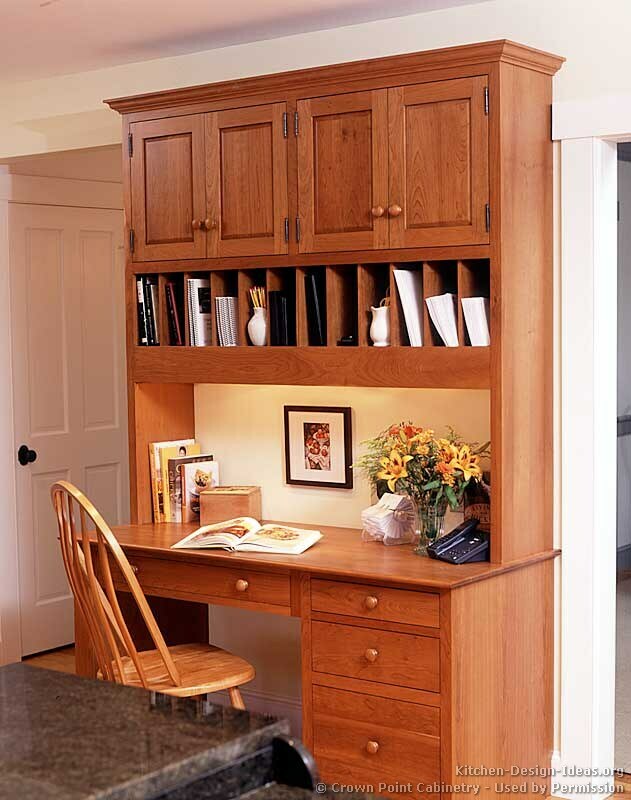 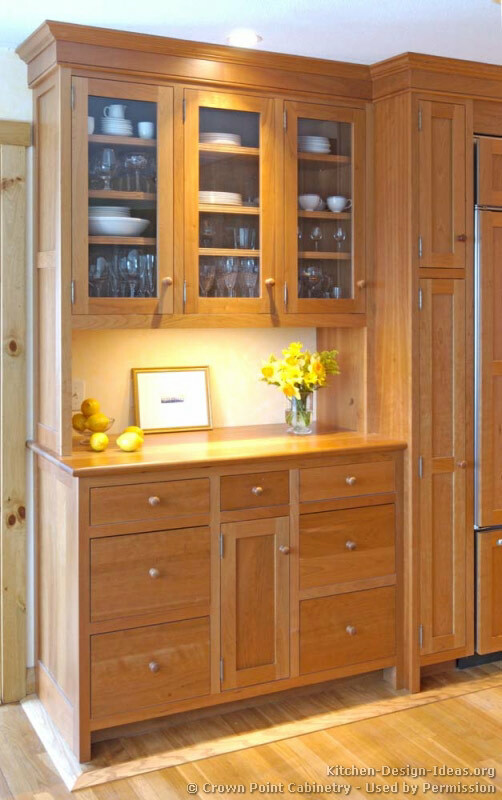 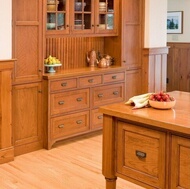 Shaker cabinets are usually crafted with local American woods including Ash, Birch, Cherry, Hickory, Maple, Quartersawn Oak, and Poplar when painted. 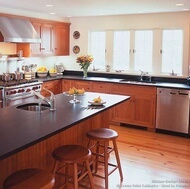 Shaker Kitchen Countertops: While granite countertops are the most popular choice, they have only been used in homes for a few decades. 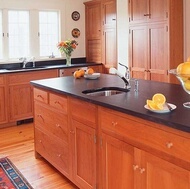 For those trying to achieve a truly "period" Shaker look, Soapstone is an admirable choice. 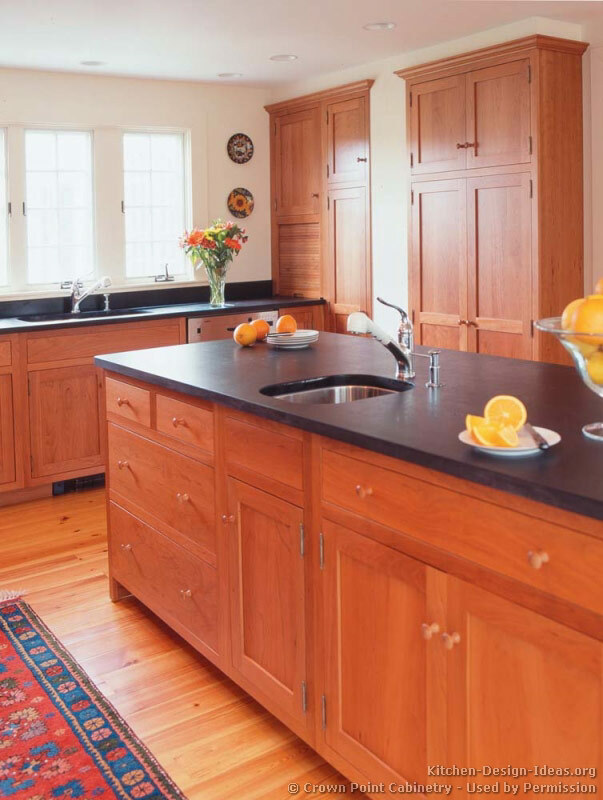 Soapstone has been used for centuries and is heat resistant and chemically inert, making it the historical favorite for chemistry labs and old hearths. 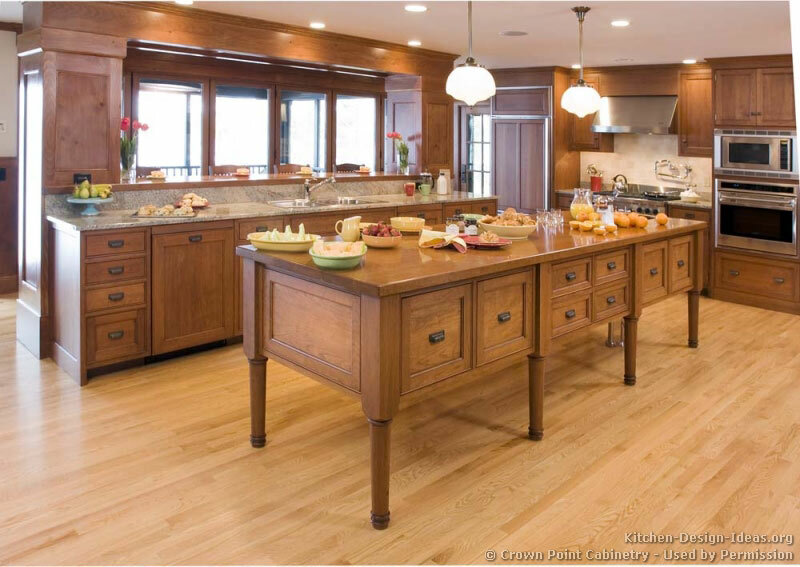 It's relatively soft surface will become chipped and scratched over time, but these can be repaired with sandpaper and mineral oil. 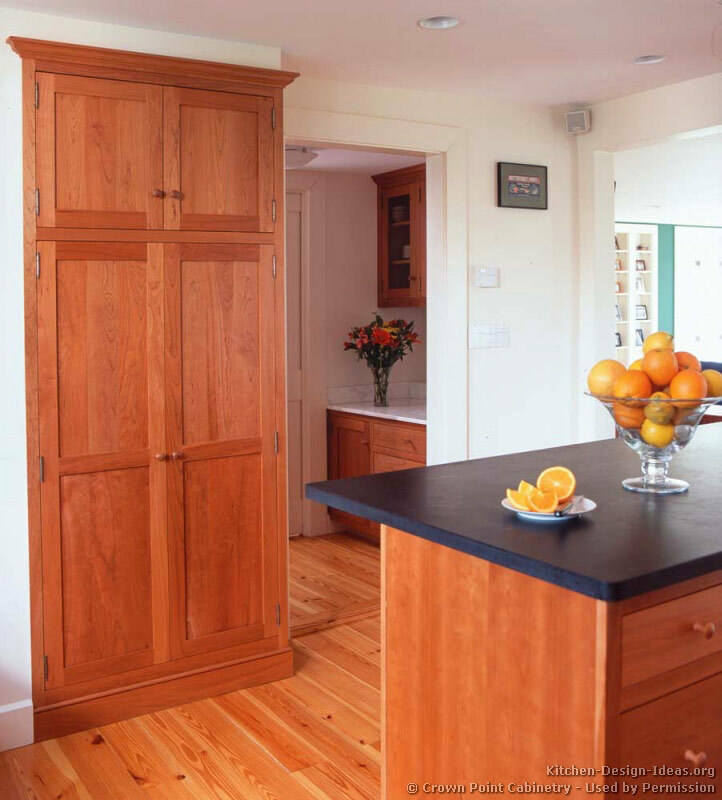 Over time, the patina of everyday use gives soapstone a sense of age and history. 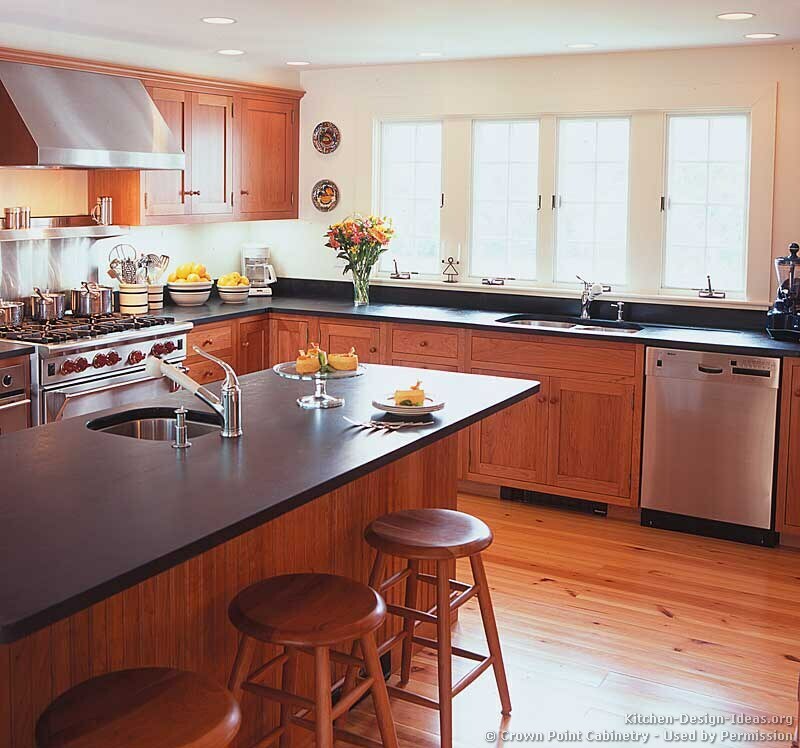 Modern Shaker Kitchens: With clean lines and minimal ornamentation, the Shaker style is often tapped for modern kitchens, too. 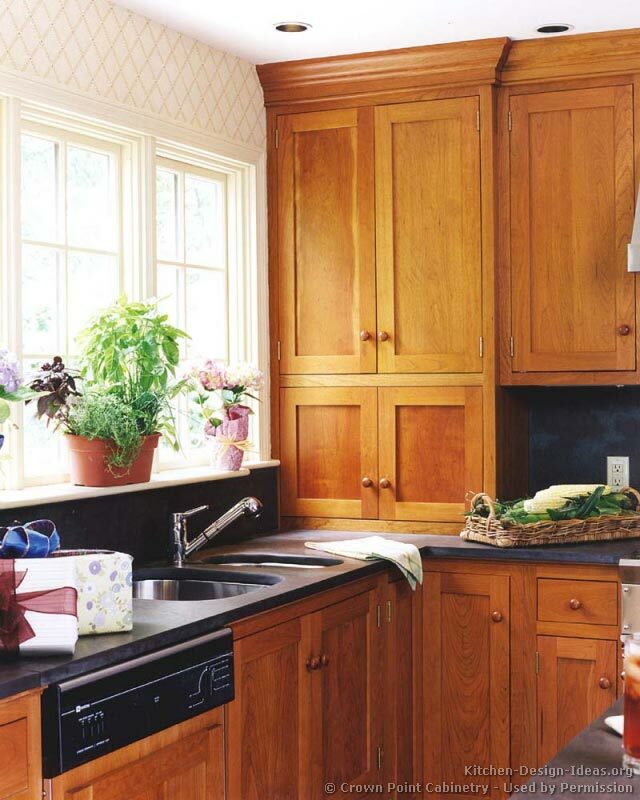 By adjusting the color scheme and introducing man-made materials such as steel and glass, a Shaker kitchen can be made to look quite contemporary. 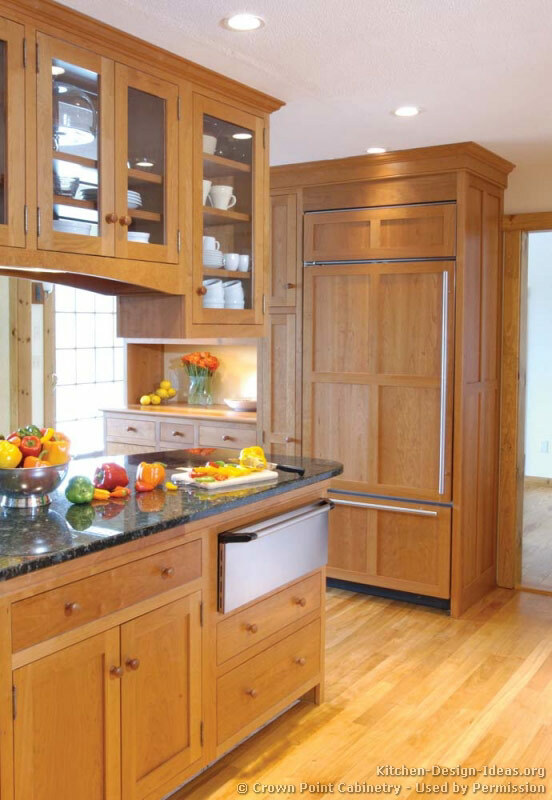 While the photo gallery below features only traditional Shaker style cabinets, you can find some contemporary Shaker kitchens in the modern galleries. 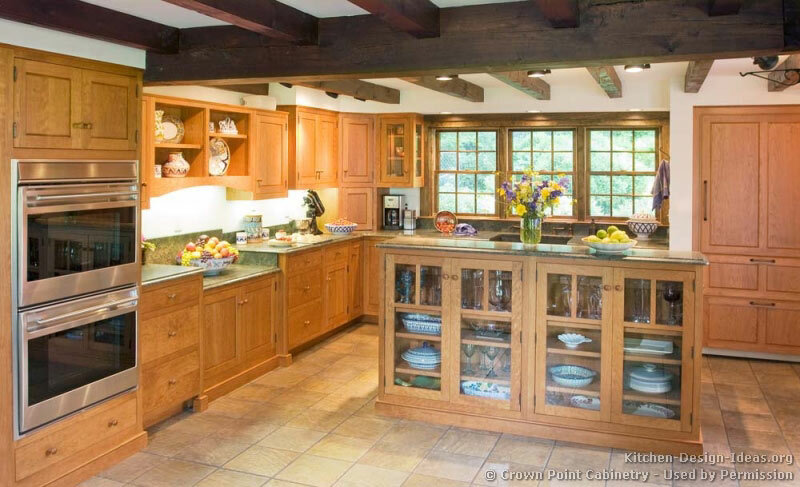 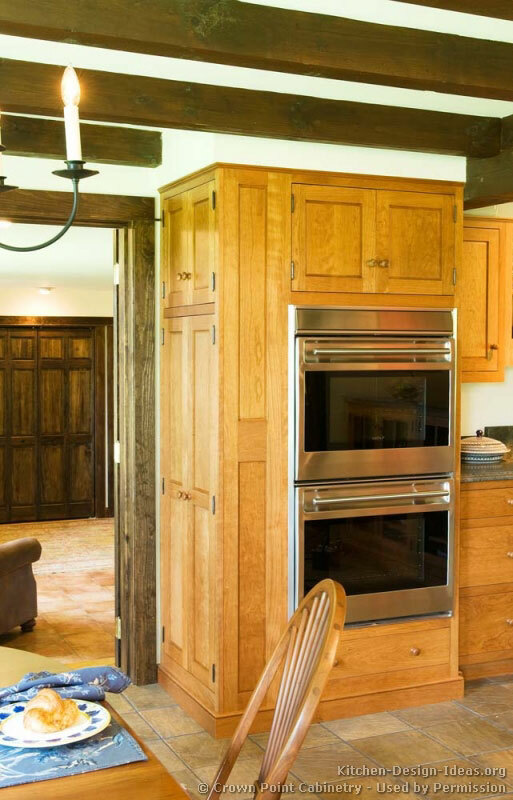 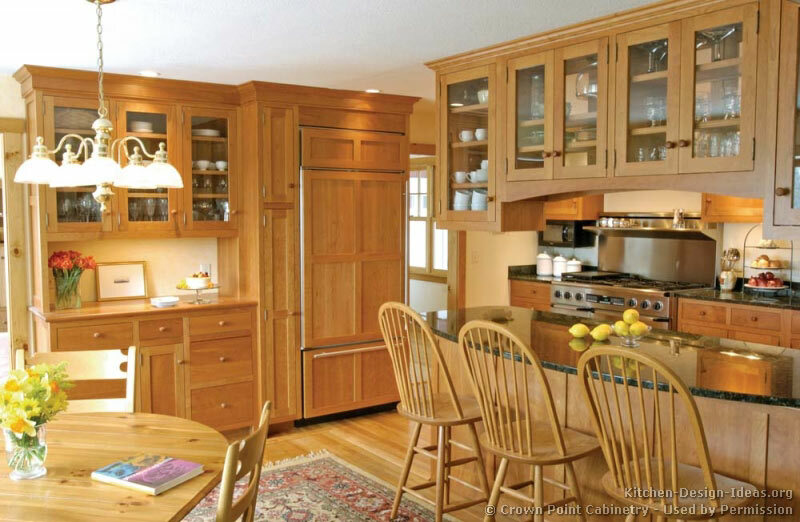 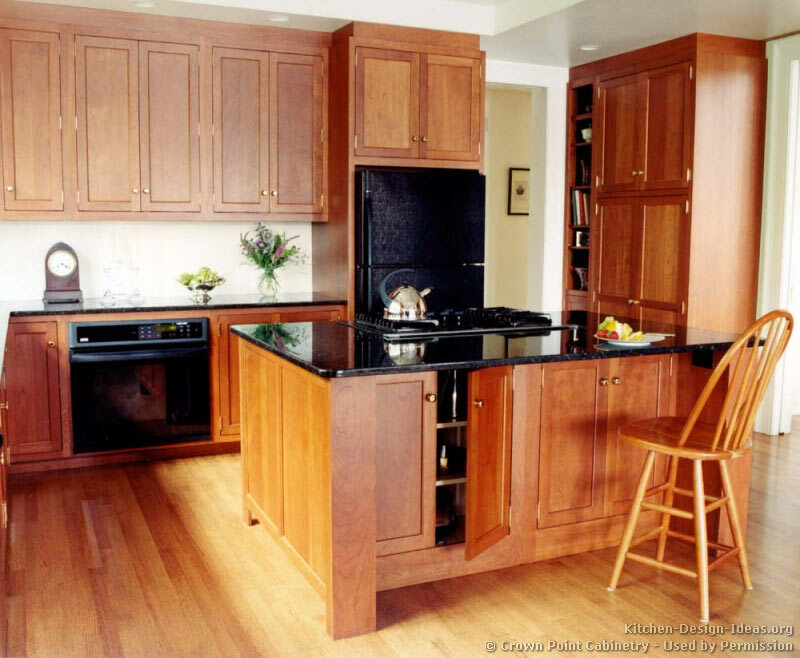 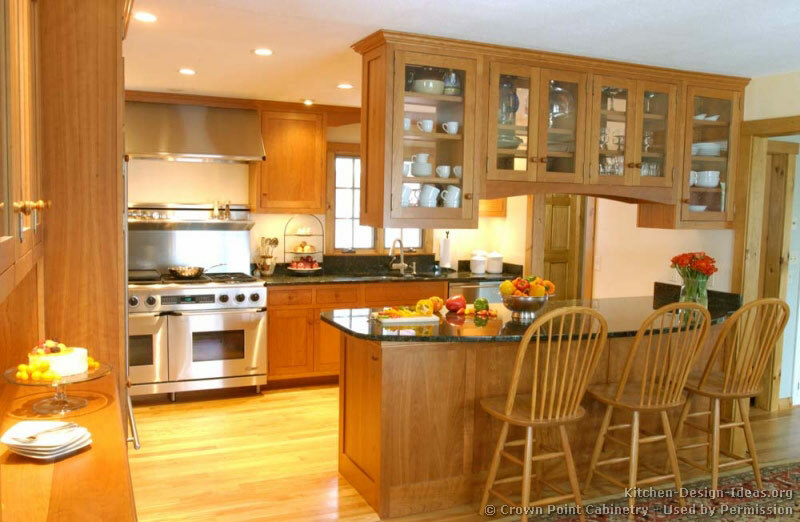 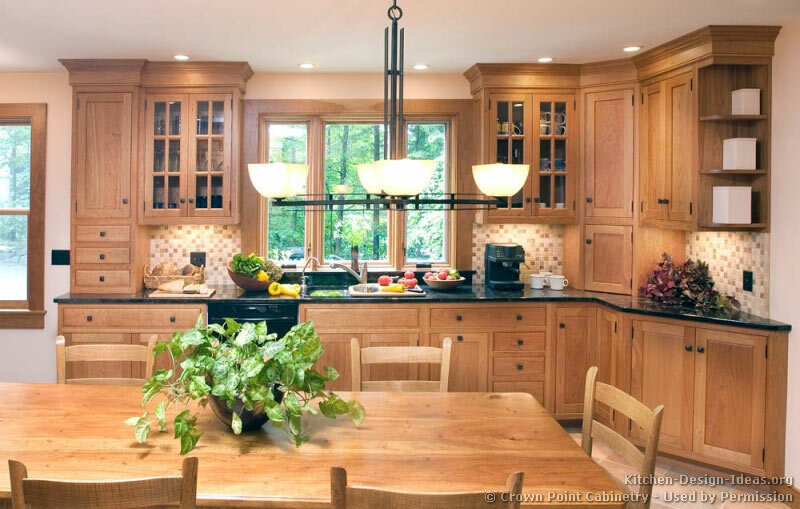 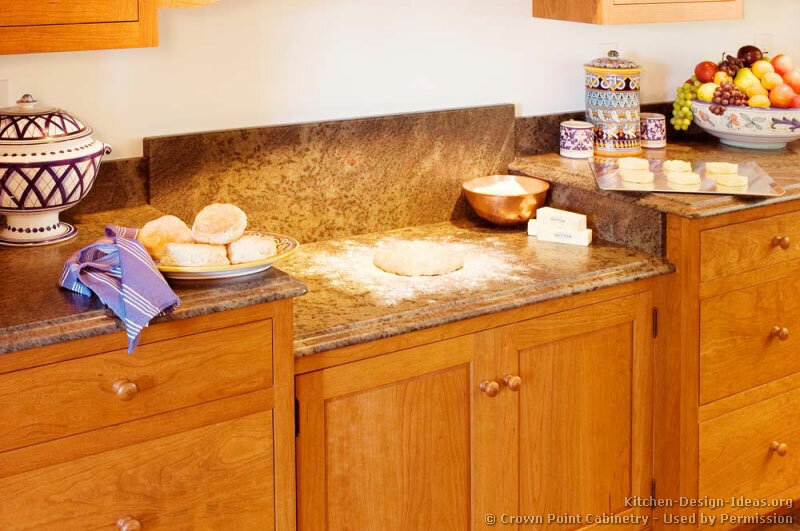 Kitchen Design Photos: Here is our gallery of traditional Shaker style kitchen cabinets with special thanks to our friends at Crown Point. 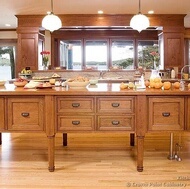 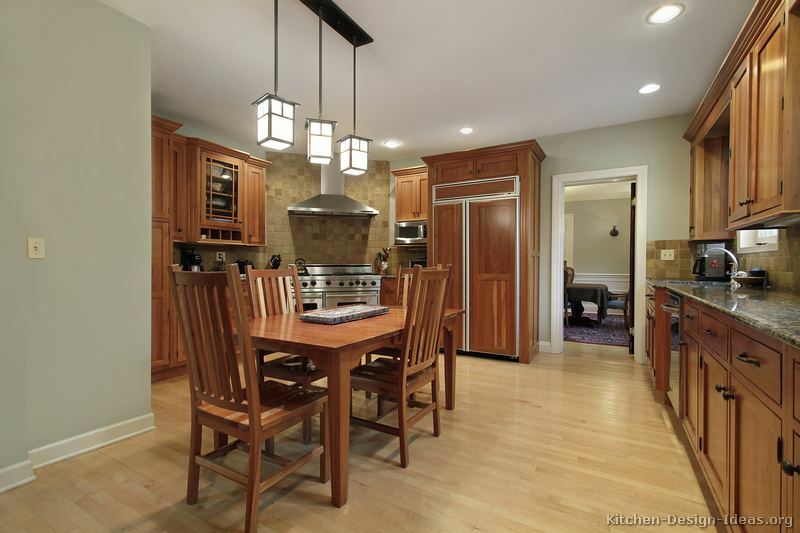 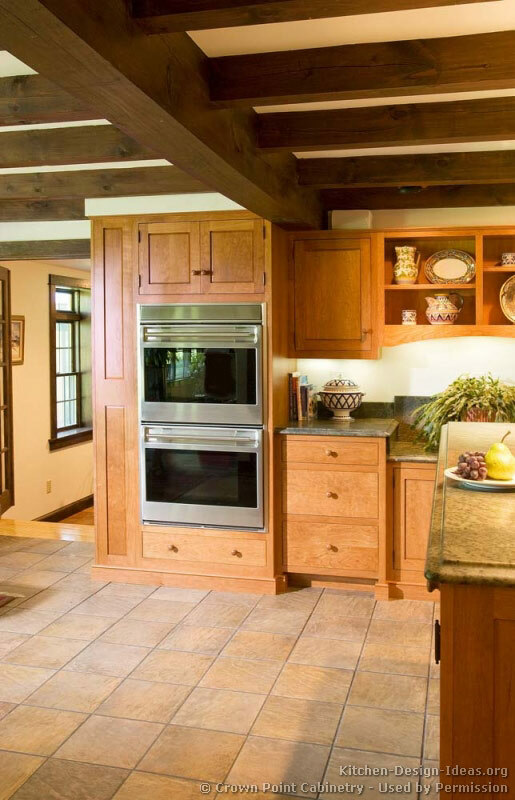 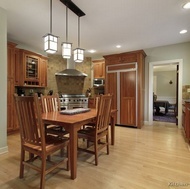 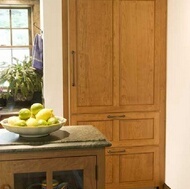 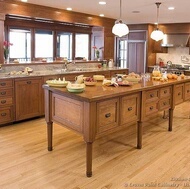 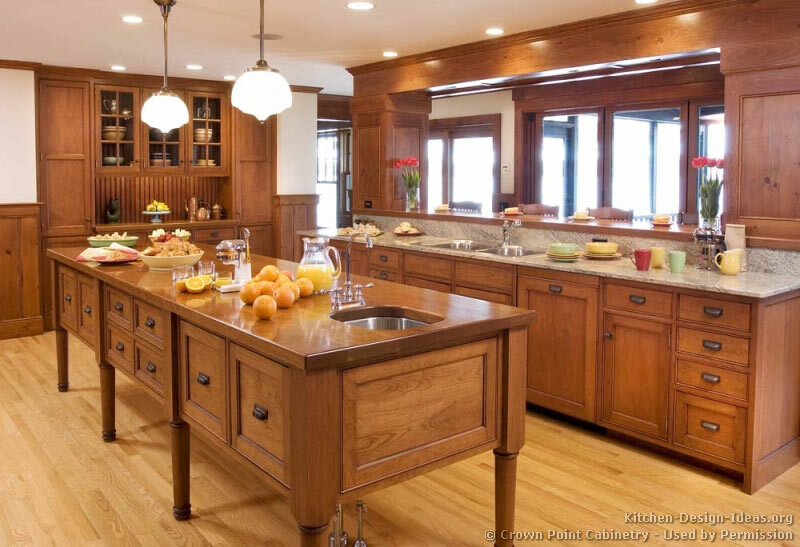 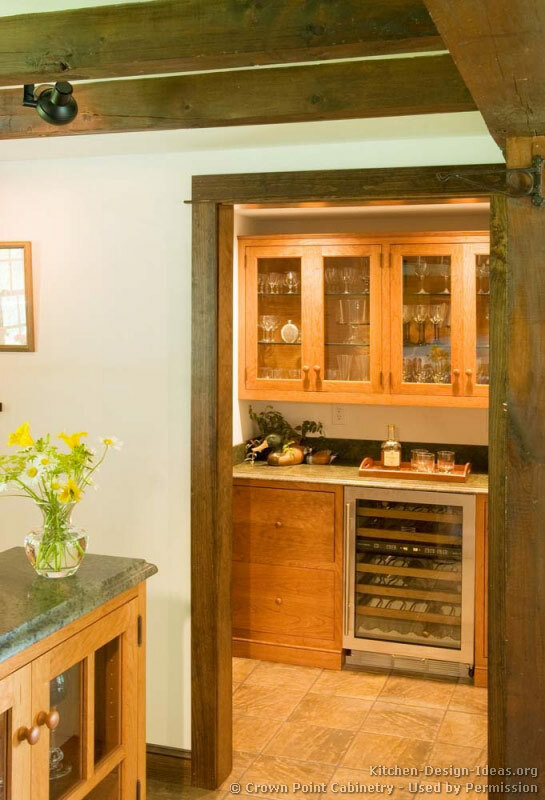 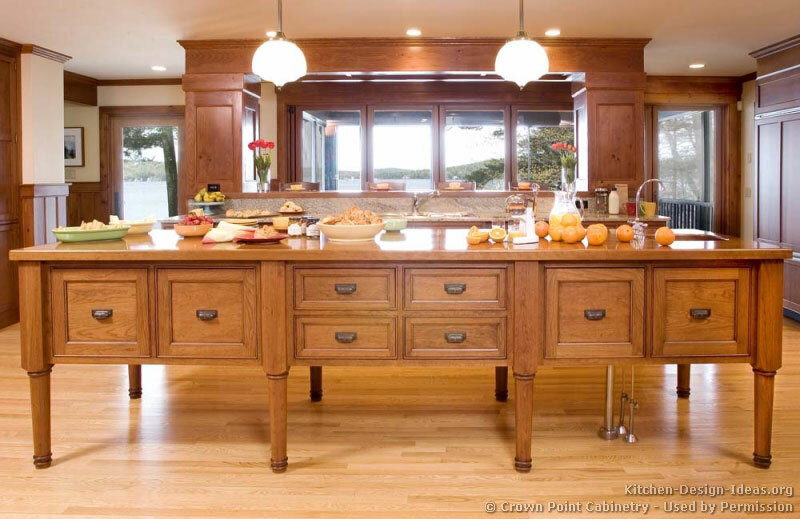 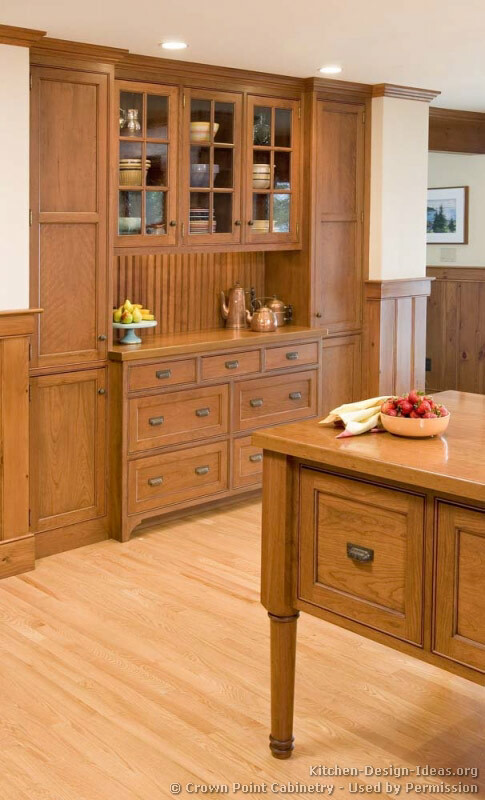 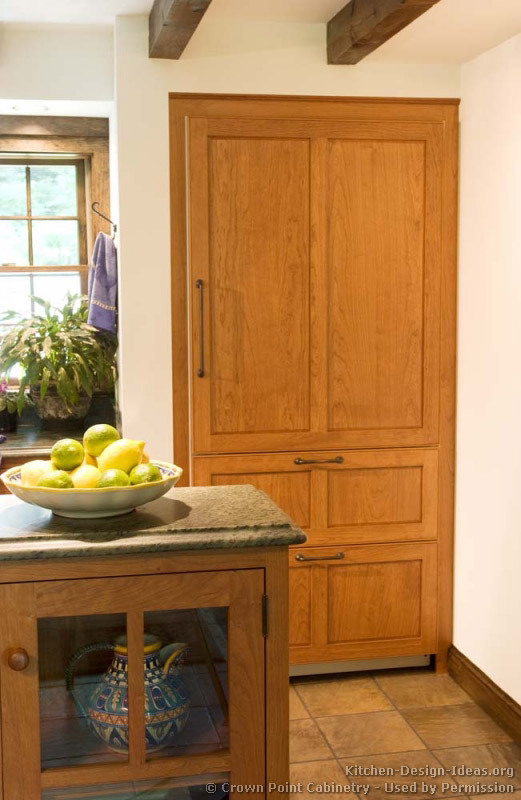 If you enjoy the beauty and simplicity of these Shaker style kitchens, be sure to take a look at the Craftsman, Mission, and Arts and Crafts kitchen galleries as well. 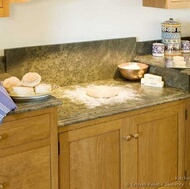 Enjoy the photos! 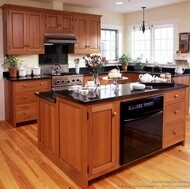 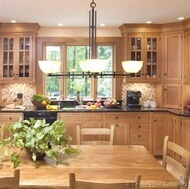 More Kitchen Styles: Return from Shaker Kitchen Cabinets to Kitchen Cabinet Styles for more inspiration and ideas.